Okay, so Avengers: Infinity War starts hitting US theatres today, but I’m taking a one-day reprieve from the Avengers stuff to celebrate today’s other notable thing: it’s Alien Day again! And I actually remembered to set aside an Aliens-related item for this year. Of course, the focus of this review, a figure based on Aliens director James Cameron, is rather amusing in light of Cameron’s comments in the last week about hoping for audiences to get “Avengers fatigue” so that we can back to creating new sci-fi ideas. You know, like those 5 Avatar sequels we’ve all really been clamoring for. That’s what the people want. I wonder how he’d feel about his action figure being smack dab in between Avengers figures. Well, he’d have to read the site for that to apply. Odds of that seem low. Colonel Cameron was a Toys R Us-exclusive figure, released as part of NECA’s running 30th Anniversary assortment of their Aliens line. He started cropping up in stores towards the end of last year/early this year. As with Sgt. Windrix, Cameron doesn’t represent a character actually from Aliens, but is more of a concept figure instead. The figure stands 7 inches tall and he has 28 points of articulation. He uses the long-sleeved Marine body we’ve seen on both Windrix and Frost. It’s still a very strong sculpt, even five years after its introduction into the line, and I can’t really see any improvements on it at this point. It remains one of NECA’s strongest sculpts, so their desire to get as much mileage out of it as possible is pretty sensible. Cameron gets a new head sculpt, which is sporting a pretty darn fantastic likeness of Cameron circa 1986. The details are sharp, and it’s well-fitted to the base body. He’ll fit right in with the rest of the crew. Colonel Cameron’s paint work is on par with what we’ve been seeing on the more recent offerings from this line. Application is cleaner than most of the line’s earliest offerings, and he makes use of the molded skin-tone plastic, which helps him look more lifelike. The detailing on the armor matches up with the other Marines, but Cameron has his own unique graffiti-ing. It’s really just a planet on his backplate. I might have liked a little bit more personality, but this is a fun touch, and it’s certainly better than nothing at all. Cameron’s accessories are his most impressive aspect. The re-used compliment includes the standard issue M41A pulse rifle, the handgun included with Frost, and a motion tracker. 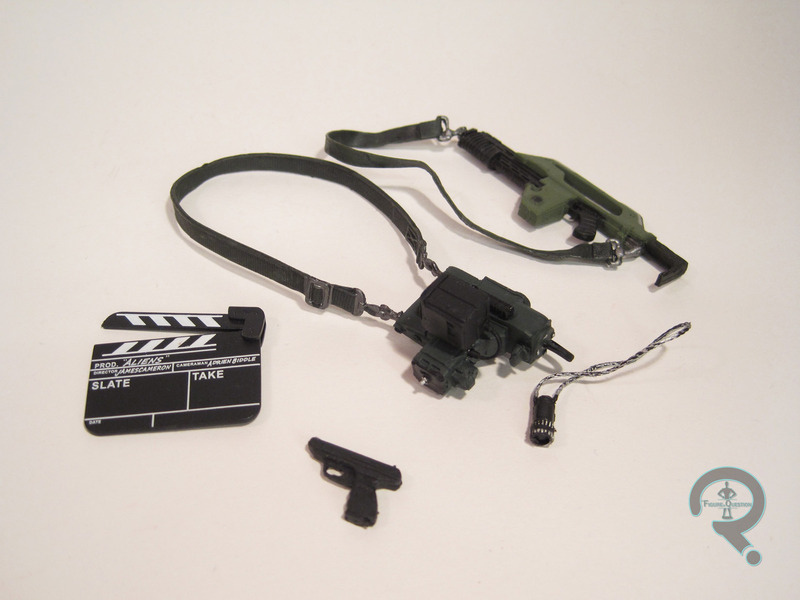 Figure-specific, there’s a clapboard (which admittedly doesn’t make much sense in-universe, but it’s cool nonetheless) and the viewfinder Cameron used when scouting locations. A lot of fun pieces in there, which show a real commitment to making this release stand out from the standard-issue figures. Obviously, the odds of me missing a figure like this were always going to be slim. That being said, I did see him a couple of times in the store before I finally got around to picking him up. It was ultimately the announcement of Toys R Us’ planned closure that pushed me to pick him up, since I definitely didn’t want to miss out. He’s another top-notch figure from NECA, and a fantastic addition to the line. Happy to have the chance to add him to my collection. A little over three weeks ago, it was Alien Day, a celebration of the 30th anniversary of Aliens, the greatest movie of all time. There was lots of awesome stuff going on to celebrate (I even got to see Aliens on the big screen!). NECA, who’ve been making Aliens figures for several years now got in on the fun by offering an exclusive figure in partnership with Toys R Us. So, without further ado, here’s Space Marine Lt. Ripley! Ripley is a part of NECA’s ongoing Aliens line. She was a special one-off exclusive, so she’s not officially part of a specific series. However, she falls in between Series 7 and Series 8 as far as the timeline of releases goes. So, we’ve got Ripley from the first movie, Ripley from the second movie, and Ripley from the third movie’s in Series 8; what version of Ripley is this? Well, it’s not Ripley from the fourth movie, that’s for sure. This Ripley isn’t based on a movie incarnation at all: she’s instead based on Kenner’s Lt. Ripley from their ‘90s Aliens line. NECA started using Kenner variants in their Predator line when they started running out of movie designs, so it’s not a huge shock to see them go that route with Aliens too. 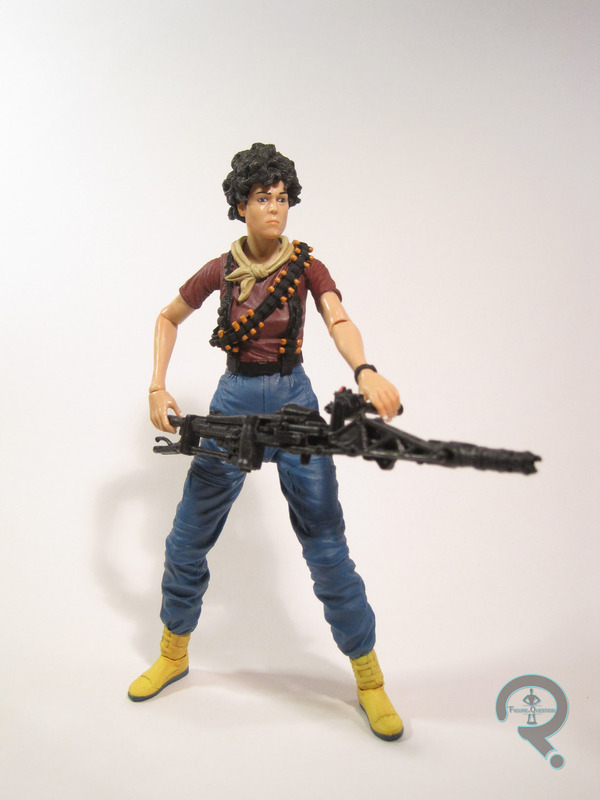 This Ripley stands 7 ¼ inches tall and she has 26 points of articulation. 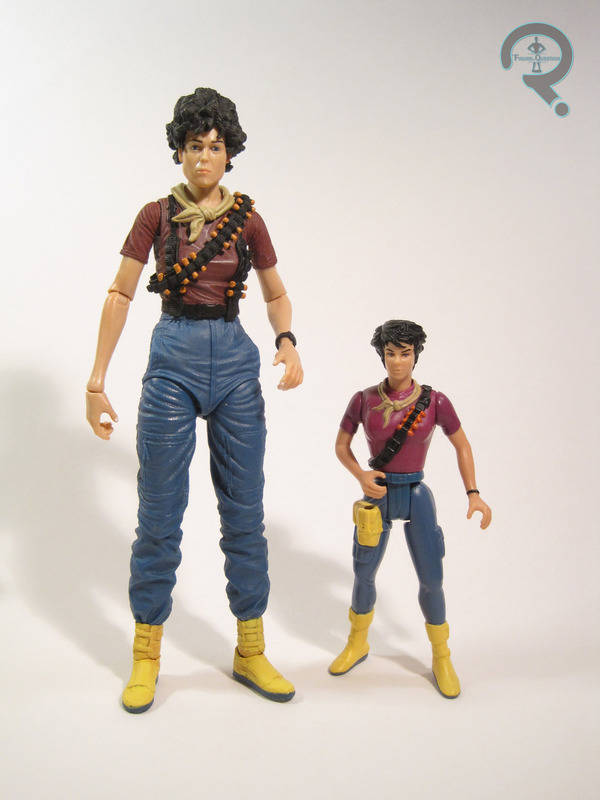 Since she was meant to be a figure that could be turned around relatively quickly, most of Ripley’s sculpt is the same as the Series 5 version of the character. That was a fantastic sculpt, and is perhaps one of my favorite NECA sculpts to date, so the reuse is far from a bad thing. There are still a few minor nits, but the good outweighs the bad by like a whole lot. 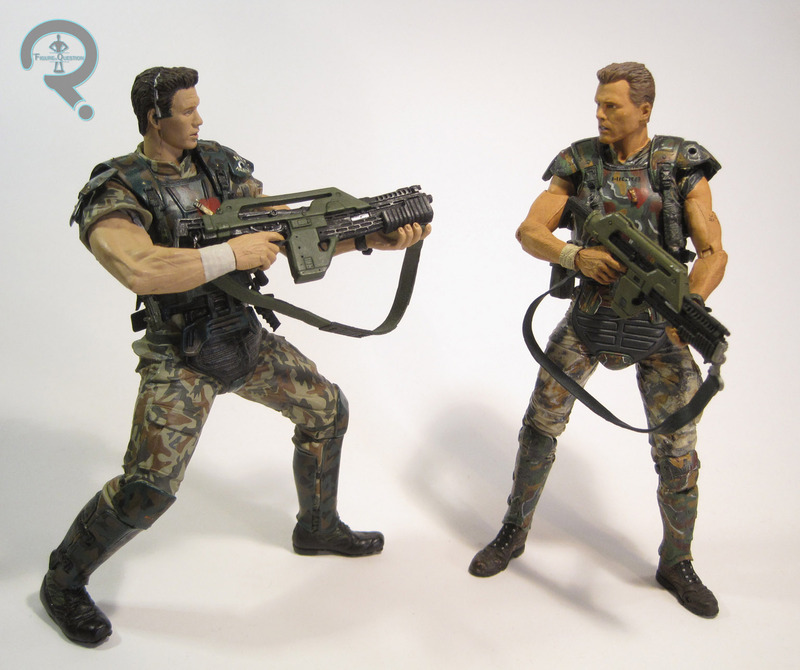 In addition, the Kenner Ripley was based on the same basic design as the Series 5 Ripley, so the sculpt really isn’t far off. To help seal the deal, Ripley gets one additional add-on piece for her bandana, which does a suitable job of capturing the Kenner piece, while at the same time fitting right in with the rest of the sculpt. The rest of the changes in design are handled via the paint job, which I must say is quite impressive. 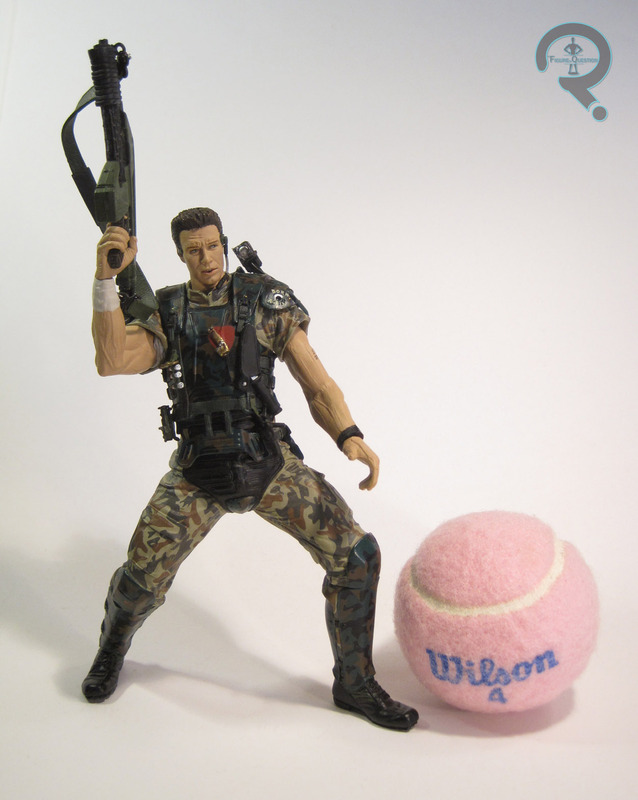 The ‘90s were a truly garish time for fashion, and Kenner’s Ripley was not unaffected by this. 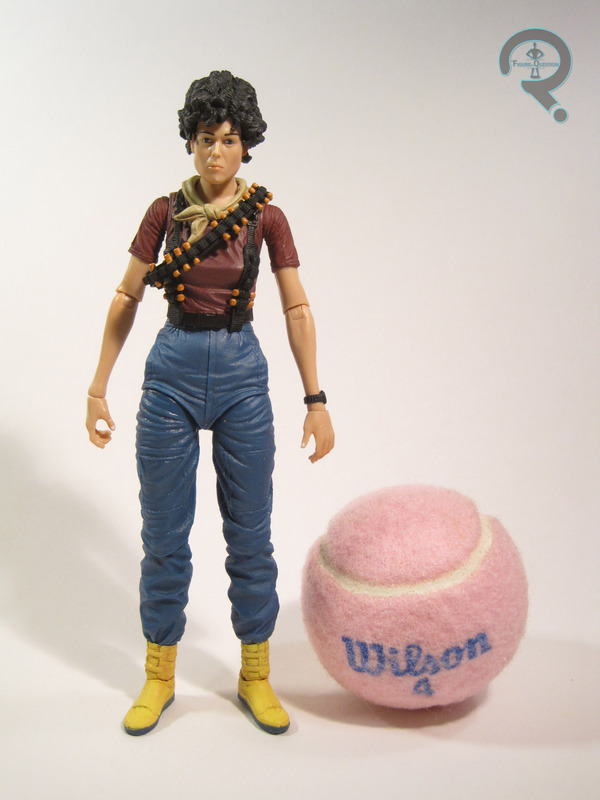 However, despite not toning down the colors all that much, NECA’s managed to make Ripley not look super ridiculous. To the casual fan, she’s a fairly serviceable normal Ripley, but a toy fan should be able to instantly recognize the reference. The original Kenner Ripley included a huge freaking flamethrower thing. To properly replicated this would have required a whole new tool that wouldn’t have been useful for too much else. So, instead of that, this Ripley gives us our first look at the Smartgun that’ll be included with Series 9’s Vasquez. Ripley has a little trouble holding it, since it’s not what her hands are designed to hold, but it’s an awesomely sculpted piece. Also, as a neat little throwback, the figure also includes a reprint of the comic included with the original Kenner Ripley (These really need to be put out in a collected edition of some sort). Oh boy, was getting this figure an ordeal. I hit up my local TRU on Alien Day with no luck finding this figure. I also had no luck finding at any of the nearby TRUs for the next two weeks. In addition, it sold out of TRU’s online store in a few hours, and then the product page disappeared, so I had no luck there. However, patience persevered, and TRU listed more stock online, allowing me to get the figure. Yay. I’m glad I got this figure. Sure, I have most of it already, but it’s an incredibly fun variant, and a wonderful throwback to my very first Aliens figure. Do you guys know what day it is? It’s Alien Day! Yes, in celebration of the 30th Anniversary of Aliens, today, April 26th (it’s 4-26, as in LV-426. Clever girl…) is officially Alien Day. There’s some cool contests and such, plus a whole ton of awesome Alien-themed merchandise, and even some showings of the first two films on the big screen. Obviously, I’d be remiss if I didn’t do something to celebrate. I’ve actually reviewed the vast majority of my Aliens collection, but have no fear; I’ve still got a few aces up my sleeve. 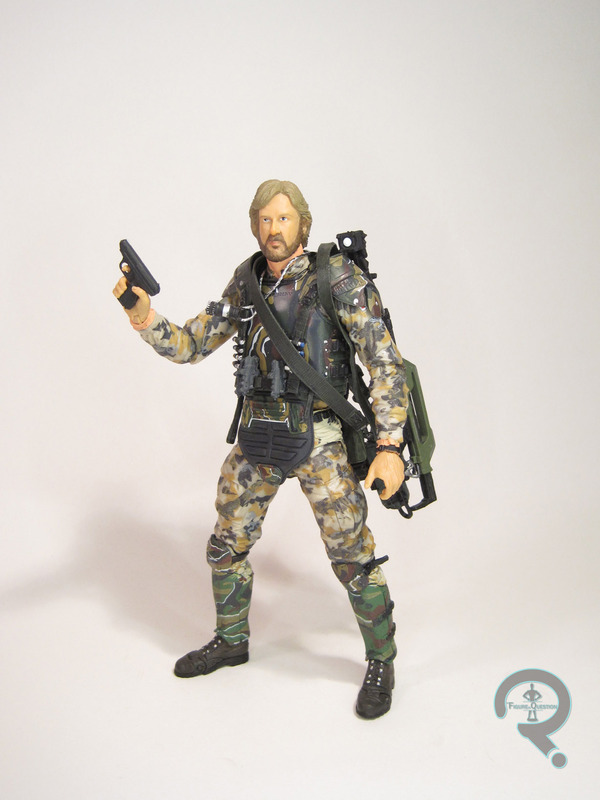 Today, I’ll be looking back at one of the earliest examples of a figure based on Aliens’ human characters, with McFarlane Toys’ figure of Corporal Hicks. Buckle up guys; this might be a slightly bumpy ride. Hicks was released in Series 7 of McFarlane’s Movie Maniacs line. By this point, they had more or less given up on keeping true to the “Maniacs” half of the title, but that was a trend that started in Series 4, so no one was super shocked. 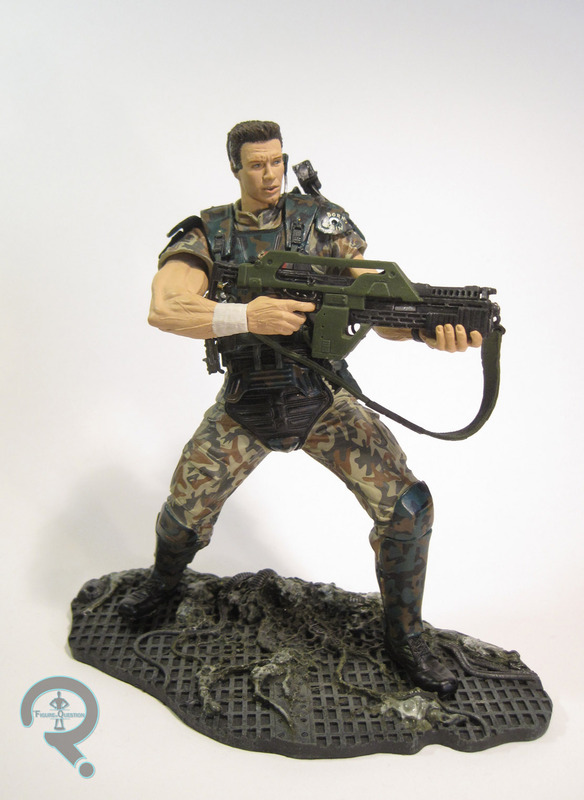 Corporal Hicks was available two different ways: there was a basic release with a pulse rifle and un-helmeted head, and there was also a McFarlane Collector’s Club version that included a helmeted head, a motion tracker, a face hugger and egg, and a shotgun. My figure is the regular release, so I don’t get all the fun extras. He stands about 7 inches tall and has 9 points of articulation. Those 9 points don’t really amount to much of anything, though, since the figure is sculpted in this odd sort of leaning back/lunging forward pose (also, thanks to the fragility of McFarlane figures, my Hicks’ right shoulder broke sometime between me putting him in storage and taking him out to write this review). The best you can really do is turn his head and slightly change the pose of the arms. But, hey, the lack of movement’s okay, because the sculpt is really great, right? Well, not exactly. The sculpt definitely has its highlights, to be sure; the general level of detail on his uniform is quite good. There are a few inaccuracies, such as the ridges at the center of his chest armor, where it should be smooth, the fitting of the back of his armor to his shoulder blades, and the lack of one of his two belt pouches, but those are small. The main issue? The body that the uniform is resting on. Looking past the weird pose, the arms and legs are huge, way too huge for the torso. The arms in particular are super massive, and almost look misshapen. On top of that the head is a bit too small. Also, while I guess the face sort of looks like Hicks, it’s far from spot on (in fact, I don’t believe they ever officially got Biehn’s likeness rights; they weren’t very good about doing that sort of thing). He’s wearing his headset from later in the film, which makes him different from the NECA figure, but it also creates a slight continuity error, since he’s still got his shoulder lamp, which he’s ditched by the time he gets the headset. If there’s one area that’s pretty solid on this figure, it’s the paint (well, provided you aren’t comparing him to the NECA version). There’s the glaring issue of him being way too pale. He also lacks Hicks’ name at the top of his chest armor. The armored pieces are nice overall, but the camo is slightly off, and lacks the white elements. The camo on his uniform is pretty well-executed, though, and all of the small detail work is nice and tight, if a bit more basic than the NECA figure. Hicks includes his M41A Pulse Rifle (not quite as good as the NECA version, but not bad for the time), a locator, a knife, and a display stand that looks like the flooring of one of the Hadley’s Hope facilities. Later shipments of the figure also included the motion tracker included with the Collector’s Club version, but mine isn’t one of them. I’d actually seen Aliens when this figure was released, and I saw it at retail a few times, but for whatever reason, I didn’t pick it up (I think I was holding out for a Ripley to go with him). A few years later, I ended up getting him as a Christmas gift from my parents. This isn’t a figure that’s aged particularly well, especially in light of the far superior NECA version. Even when he was new, he felt sort of unfinished, due to neither the regular or exclusive versions offering a complete set of accessories. That said, taking him back out to review has reminded me of a lot of the more endearing qualities of the figure. 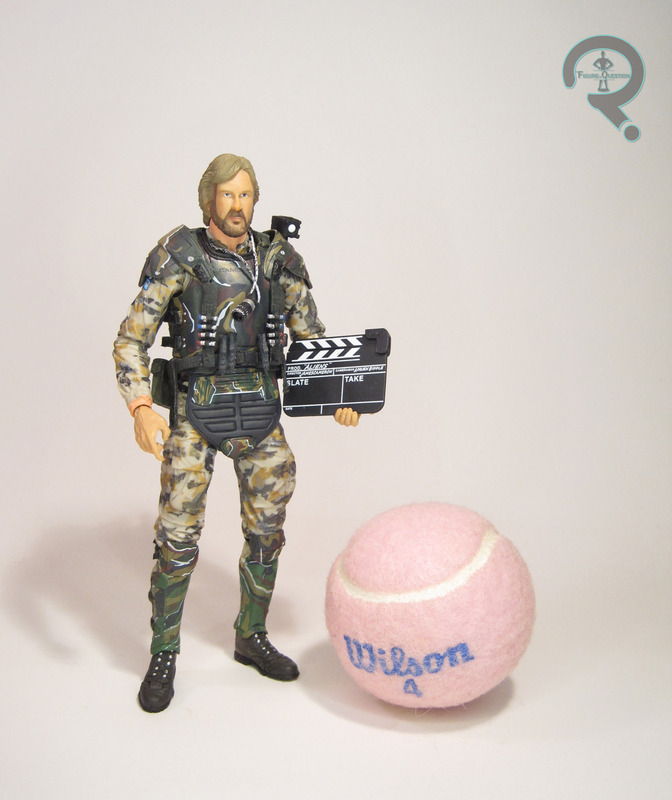 There was a time when he was the best Hicks figure I owned, and I do still have some very fond memories of that.